Felix Avitia Photos, News, and Videos | Just Jared Jr. Check out this awesome Disney Channel family pic from Instagram! Series stars such as Stuck In the Middle‘s Jenna Ortega, Kayla Maisonet, Isaak Presley, Ronni Hawk, and Ariana Greenblatt met up with Best Friends Whenever stars Landry Bender and twins Matthew and Benjamin Royer for a network retreat. They joined Bunk’D‘s Nathan Arenas and Nina Lu, Trinitee Stokes, Kirby Buckets’ Tiffany Espensen and Cade Sutton, plus Walk the Prank stars Bryce Gheisar and Jillian Shea Spaeder, and Gamer’s Guide‘s Felix Avitia. “I had so much fun today! I learned so much from this class and I’m just so happy I get to be surrounded by such AMAZING PEOPLE who I TRULY LOVE!! #squad #one #of #my #squads hahaha #fun #friends,” Nathan captioned his shot on Instagram. Check out another pic from Ariana below! Franklin (Felix Avitia) wears a caped jumpsuit to school in this new still from Gamer’s Guide to Pretty Much Everything. 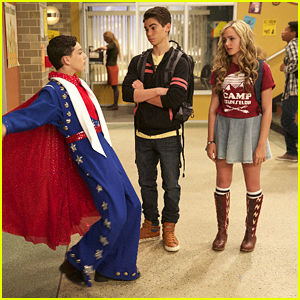 In “The Prank of the Century”, in an attempt to win Pranktube’s annual “Most Viewed Prank” contest, Conor (Cameron Boyce) and Ashley (Sophie Reynolds) pull the prank of the century on Franklin. And by the looks of it…is working! “The Prank of the Century” airs TONIGHT, Wednesday, November 4th @ 8:30PM ET/PT on Disney XD. Check out all the sneak peek pics below! 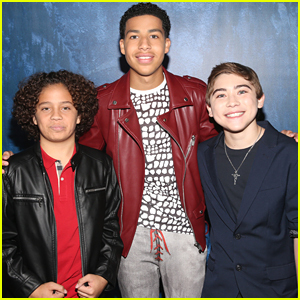 Cameron Boyce & 'Gamer's Guide' Cast Hit D23 Expo 2015 Together! Cameron Boyce gets ready to meet fans as he arrives at the 2015 D23 EXPO held at the Anaheim Convention Center on Sunday (August 16) in Anaheim, Calif. 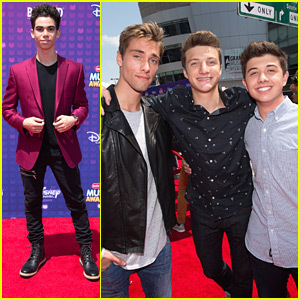 The 16-year-old actor was joined by his Gamer’s Guide To Pretty Much Everything co-stars Sophie Reynolds, Murray Wyatt Rundus, and Felix Avitia as they took photos together. “WOW. So glad I got to meet so many of you amazing fans at #D23Expo today. You make my heart happy THANK YOU! !” Sophie tweeted. Check out more fun photos below!